We thank Vicki D Photography for sharing her photos of Danny Gokey performing at Winter Jam 2019. This tour runs all the way until the end of March! Are you going to make it to see Danny, The Newsboys, Mandisa, Jenn Ledger and more? Check out the dates HERE. Posted on January 31, 2019 February 22, 2019 by JanPosted in Discussion, PhotographsTagged Vicki D Photography, Winter Jam. I wish I could make it to Winter Jam, but too far to travel. Very excited for Danny and Leyicet with their baby news! I wonder how many children they will have? It’s been fun watching their family grow. Beautiful family. Is it still bitter cold where you are Jan? I’m not sure where everybody else is.. hope everyone stays warm. We are having rain right now. Snow will come later. I hope not too much. These are really nice photos from Vicki D, aren’t they? It has warmed up here! It’s only -10 tonight, LOL! But tomorrow will go into the positives and then the weekend is suppose to be unusually warm. Crazy weather. The good news from this frigid weather is that the foresters are saying the extreme cold may have killed the ash borers that have been killing our ash trees. At -30 degrees, 90% of the insects would be destroyed? I’ll take any bright side to this extreme cold! I’ll confess, I’m a numbers person…. and I am competitive. Hopefully that doesn’t shock anyone. We restarted our facebook page as Dannygokeynews in September 2015 when we had to take down iheartdannygokey.com. We are now at 6,665 followers and 6,564 likes. Not bad. I do try to keep the content fresh on social media since website visits are not like they once were (iheartdannygokey had a TON of traffic when Danny was on Idol.) I do see a drop off at other blogs, too. We have more Instagram (1670) followers than we have twitter followers (1,232). Other than for President Trump, twitter is not nearly as popular of a media as it was in 10 years ago. Jan you are doing a great job of running this site and other platforms and we appreciate your work. Thanks, Mr Bing. I appreciate your kind words. Of course I wouldn’t have undertaken this without Steph’s work behind the scenes — and her presence here! Good to see the new song moving! It will be interesting to see how things play out with the new label. We got our first snow of the season yesterday — one or two inches that melted by mid-afternoon. But it was so pretty! Like a winter wonderland. The audio interview from the Fish station has some things I haven’t heard before. The tv show idea is “in a contractual stage” ?? I see we were on the same path, Admin2. I added both to my post and posted it on social media…. HSIY is doing very well on the Mediabase, Billboard and iTunes Christian song charts. Top 30 on Mediabase with 21 monitored stations spinning it. I think it will have at least 8 monitored station adds tomorrow. Good early signs on the radio front! Danny keeps talking about Hawaii, maybe he needs to visit the Honolulu station on Jan’s radio breakout… Or just buy a ticket sometime he’s out toward L.A. The Michael W Smith tribute event continues to grow. This seems like a natural for some family-friendly / Christian-oriented tv outlet to show eventually. Danny was suppose to do a radio event last year in Hawaii (and there was tweets about him visiting the station?) but it got cancelled. I’d imagine it will happen sometime. Danny is nolonger the artist at the end of the KLOVE cruise artist list. So, they bus trouble and Danny did his whole set tonight in a hat…. no showers or time for primping? Is that a new cruise promotion for 2020, or did we (Jan 🙂 ) already know about it? I wonder if they would have put Danny on after the Newsboys if he had been late? Really nice chart news for HSIY! Biggest gainer on digital sales? (Christian songs) Nice! Seems like the new record label is off to a good start. There haven’t been many tour review/recap articles but here’s one for WinterJam recently in Little Rock. After a brief intermission former American Idol alumnus Mandisa took the stage to perform some of her hits including “Overcomer” and “Unfinished”, and proving yet again that she’s so much more than she seems. Her powerful voice filled the arena and spreading the message of good news and the love of God and each other as she sang “Bleed the Same” along with tourmate Danny Gokey, who was next in the line up. 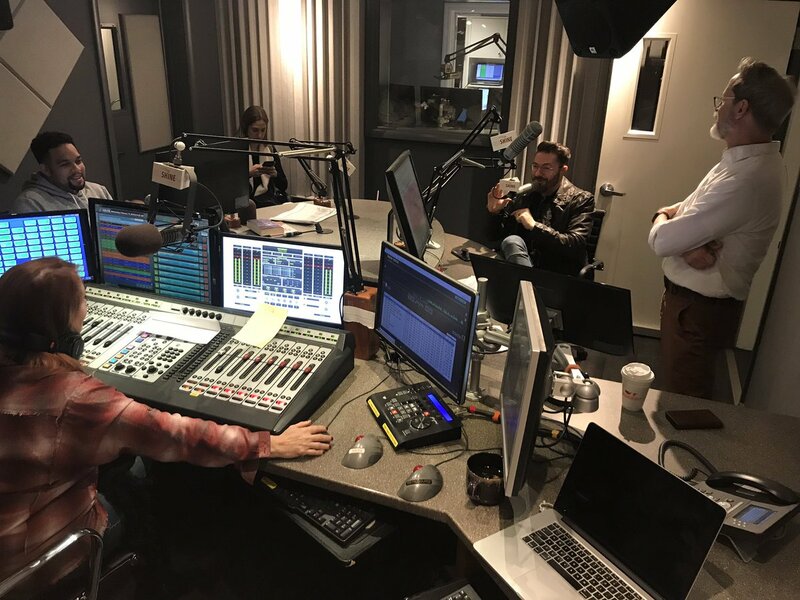 @951SHINEFM: 🚨🚨🚨Get to your radio stat…@dannygokey is in the studio now! I see they played HSIY and then Masterpiece. I wonder if this station didn’t play IYAII? We sure got the snow to go with the snowflakes at this site! We got about 8 inches of the white stuff yesterday. And then 30MPH winds to blow it around. Its time for me to go back out and clear my sidewalks, again. Interesting. Wonder what the song choices are. Star FM has three videos up from Danny being in studio this morning. 2) a top notch song to promote. I can’t wait to hear the rest of the songs on the new album. Danny stopped by to see Jayar, too. Probably when he was down in FL or GA earlier this month? And how does he talk this long without taking a breath? Lung control from singing?!? Jan, I don’t believe that I have heard Danny sing “Can’t Help Falling in Love” before. Those ladies came up with some “interesting” ideas in that last video! Danny’s HSIY has the highest spincrease on the Mediabase CAC chart today. Danny’s song has the highest AI at 4.087 to get to the Top 20, but it needs 316 spins to reach the top 20 of this spin focused chart. Glad to see Danny’s song doing well on the charts. This is for Admin2. Who knew the reach of country music would extend into Mongolia? BTY, you can fast-forward to the 1:18 minute mark to hear the song & afraid the reaction video section of the video. I never knew reaction videos were a thing . . .
BTW, bad news apparently comes in threes. I have some potentially serious health issues going on. Will know more in a few days. Oh, and I meant to thank Admin2 for bringing over video of Elvis singing “Can’t Help Falling in Love.” Hopefully Mr. Bing got to see it. Obviously Danny needs to concentrate on his own music, but it’s always fun when artists add a cover or two to their concerts. I think Danny could do well covering an Elvis song or two. I’ll have to think about which song I think would fit him best. This is for Mr. Bing. It’s from the all-star tribute last night. [Did anyone watch the Elvis tribute? I don’t get NBC on my TV, so I couldn’t. 🙁 ] IMHO only, on this song, Elvis blows away all of those doing tributes, including Carrie Underwood. ELLEN.Thanks for the link.After watching it I think I heard the song somewhere.But I didn’t know its Elvis.Nowadays lots of musicians cover his songs and younger generation probably wont even know they are originally from Elvis.I listen to 500 Miles a lot and always thought it is a original Justin Timberlake song. And I hope you worried for nothing and stay perfectly healthy. Thank you, Mr. Bing. Please keep me in your thoughts. Things don’t sound too good so far. We will definitely send you positive thoughts and keep you in our prayers, Ellen! All the best, Ellen. Keeping you in my thoughts and prayers. Wishing you good news on the health front, Ellen. I also found a pretty good video and we were granted a couple of awesome photos to use by photographer Ashley Jill! I see that they have the other Kevin back on saxophone since Simon Yeh had to rush home with his wife going into labor a week early. Their first, a baby boy. A preview of the album art and a link to pre-order Danny’s newest CD on Amazon is available! So April 12th does seem to be the date! Too bad no track listing yet. I tend to think they don’t mean new “single”, but a second track released digitally / streaming before the album in full is available. It doesn’t seem the right timing to push a new single even if HSIT is moving fast so far. Another interview from the WinterJam circuit, this time out of Knoxville area. Got the results. Sounds like everything will be okay. But I dodged a real bullet. I’m relieved for you, too, Ellen. I expect it will make it to #20 this week. Currently 21. Ellen.I am happy you are safe and sound. Thank you, Admin2, Jan, and Mr. Bing! I am so relieved. A new discussion post is up!